Headlights are a painful problem for video surveillance. Figuring out how to overcome headlight's glare is both a fascinating and frustrating endeavor. Unfortunately, these challenges have not received enough attention and focus. If you want to capture license plates, regardless of how much resolution you have, you are going to have to deal with headlights. We have been doing numerous tests and conducting research into best practices and options. This report is a pre-requisite and companion to our License Plate Capture Shootout results. However, in performing these tests, we realized that the impact of headlights is so severe and so central that it demands a dedicated report explaining the issues involved and providing recommendations on how to overcome. While we see significant interest in doing both, practically speaking, you need to choose between one or the other. The only way to do both is to dedicate two cameras to the location. You will not capture all the plates. Even with using multiple 'tweaks' you might still miss half of the plates. The problem with headlights is a strong WDR issue - not feasible to overcome without tradeoffs. Headlights vary significantly so an optimization for one vehicle's headlights can easily make it worse for another vehicles. Shortening the exposure will reduce the glare from headlights but will also make the overall scene darker - often an unacceptable tradeoff for users. Color might be better than using black & white as it tends to produce less headlight glare. Higher resolution can help provide details but will not solve the key problem of headlight glare. Adding in illuminators (IR or white light) can help moderately. 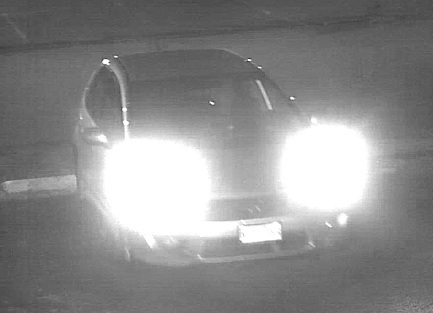 Adding on IR bandpass filters to a regular surveillance camera is not recommended as it is costly, has significant tradeoffs and does not substantially improve license plate capture. Over a few feet, the lighting drops significantly (a variation of about 6.5x). The result is that the image quality suffers - usually either the darker or the lighter part as the camera needs to 'pick' one to optimize. Typical WDR surveillance scenes occur during the daytime so absolute low light is not a problem. However, when dealing with headlights at night, this does become an issue. 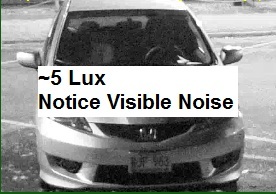 Even at approximately 5 lux, the visible noise is clearly impacting the clarity of the image and, in particular, the legibility of the license plate. This is a fundamental aspect of night time surveillance. Gain is necessary but reduces the overall resolving power of the image. The only other option is to lengthen exposure. While that will allow a reduction in gain levels, it will result in severe motion blurring of moving objects. Headlight scenes combine both challenges - low light and WDR. Indeed, the WDR challenge for headlights is actually worse than what is commonly seen in indoor / outdoor doorways - the most common reference case for WDR challenges. While the specific lux levels of headlights vary based on how and where you measure the light, the variance between the area in front of the headlights and the license plates (just a few feet away) is always very steep. The light output / strength of headlights can vary significantly. While overall regulations exist, the output power can vary and the level of grime, dirt or other obstructions can impact the overall strength of the beam. Where the headlight is aimed can vary. While standards exist and inspections occur in many regions, the aim of the headlight can shift over time - impacting where the light is projected and how close it is to the license plate. The style of the headlamp: Some headlamps direct the light more towards the outer side, others in a circular fashion straight ahead and still some more towards the center. Even with the same level of light output, the impact of the headlight on a license plate can vary notably. The distance between the headlamp and the license plate. All things being equal the closer a headlamp is to a license plate, the worse the lighting challenges will be. Some vehicles have their headlight a foot or two above the plate, others have them on the same vertical level as the plate. The level of variations and issues with headlights is pretty interesting. The amount of information online is fairly weak with the best primer on headlamps / headlights being the Wikipedia entry (which is well written and thorough). 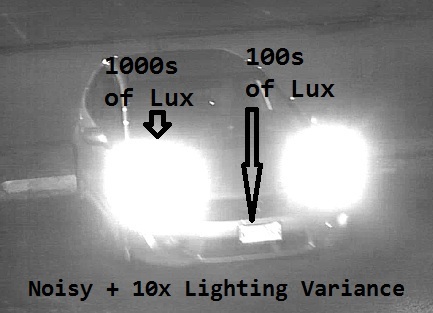 Because of these headlamp variations, a tweak or trick that improves surveillance quality for some vehicles is unlikely to work for all vehicles. This is important to keep in mind as one attempts to optimize camera settings. When looking at optimizations, the most common one recommended is to to shorten the exposure time. There is no single 'right' exposure setting. People will often talk about 1/60s, 1/120s, 1/250s or 1/1000s exposure settings. It depends on the overall brightness of the scene one is optimizing. There is no single exposure setting that will work with all vehicles using 'regular' surveillance cameras. Because of variations in headlamp lighting, one exposure setting may be too dark for vehicle A but just right for vehicle B. If the exposure setting is slowed to provide more light for vehicle A, vehicle B's plate is likely to be over-exposed. Shortening the exposure time will darken the rest of the scene and can make the overall camera unusable for anything but license plates. This often runs counter to expectations of users who, understandably, would like their cameras to see both people clearly in the background as well as the characters of a license plate. Unfortunately, this is generally not feasible. While higher resolution can help, it does not address the main problems in handling headlights - glaring lights. If you can overcome or mitigate the headlights, higher resolution will help provide greater details and/or expand the coverage area. However, most megapixel cameras use slow shutter defaults. These defaults regularly wash out the front of the vehicle, especially if the vehicle is moving. Pay careful attention to shortening the shutter speed. The second most common recommendation after shortening the shutter is to add IR or white light illuminators. In our tests, these can help moderately but will not completely overcome the power of headlights. We are assuming users will add surveillance 'level' spot illuminators. These will increase the effective illumination of the scene by 5 - 20 lux (depending on the strength of the illuminators and the distance of the target from the illuminator). This is sufficient to increase the probability of capturing license plates but might make some plates overexposed (similar to how changes in the exposure setting will make some plates over and others underexposed). The last element we will review is using IR bandpass filters. These are very common in dedicated or specialized license plate capture cameras. What these filters do is block all visible light and only allow IR light (e.g., 850nm, 940nm, etc.). If you are looking for a camera dedicated to capturing license plates and are willing to forgo capturing the overall scene, we recommend buying such a camera with such a filter built in. Your camera can now only operate in black and white mode 24/7. These add-on filters are mounted in front of the lens, blocking out color 24/7. Headlights generate high levels of IR light. In our tests of an add-on IR bandpass filter, the filter only removes a slight level of headlight glare. The camera still picks up a very high level of IR light from the headlight. As such, the performance improvement is not great. Surveillance lenses generally do not come with threads to easily add a filter nor do they generally list their diameter size. This makes finding the right size filter complicated and expensive. It is hard to find surveillance filters and they are expensive. 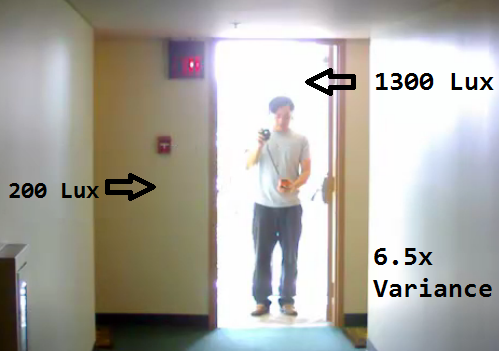 We paid over $150 for an IR bandpass filter and a mounting adaptor to make it fit with a regular surveillance lens.